It’s never too early to discover STEM. 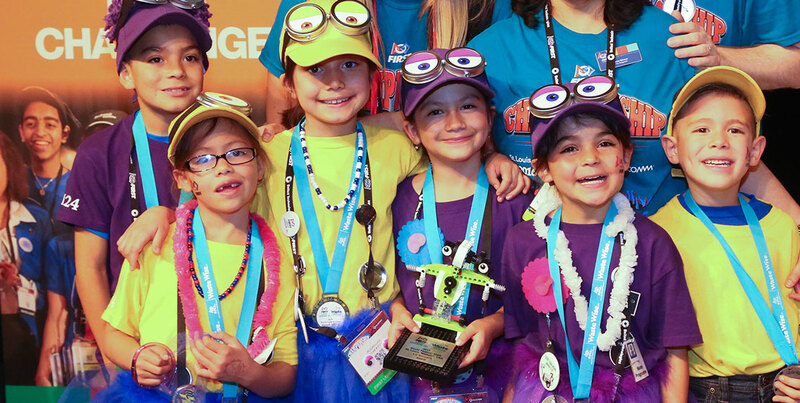 FIRST LEGO League Jr. is designed to introduce science, technology, engineering and math (STEM) concepts to kids ages 6 to 10 while exciting them through a brand they know and love − LEGO®. Guided by adult Coaches, teams of up to 6 members (grades K-4) explore a real-world scientific problem such as food safety, recycling, energy, etc. Then they create a Show Me poster that illustrates their journey of discovery and introduces their team. They also construct a motorized model of what they learned using LEGO elements. In the process, teams learn about teamwork, the wonders of science and technology, and the FIRST LEGO League Jr. Core Values, which include respect, sharing, and critical thinking. At the close of each season, teams come together at Expos to strut their stuff, share ideas, celebrate, and have fun! Looking to join a team? Click here to find nearby teams. Learn more about how you can volunteer to help at a competition? Find all the resources to help you with your team. Sign up for our monthly newsletter and read previously sent emails!